I'm an East Coast kinda gal. I love seafood. Maryland and Maine Seafood that is. The plainer the better. Depending on which I have just finished eating, I prefer lobster or blue crab. In Maine, it's lobster with melted butter and lemon, in Maryland it's blue crab steamed with Old Bay Seasoning. This is not to ignore the tender fried clams that have brought me orgiastic pleasure. Yes, I will have another dozen please. And oysters? Gibson Island on the Chesapeake Bay used to have an annual oyster roast.. raw, in a creamy stew, barbecued, fried... Ah, but I digress, and I haven't even mentioned the mussels at Jakes's in NYC. I'm here in the mid, mid-west now. Camped about 25 feet above the Red River and below the 165' high Denison Dam. I can stand on the bank outside our camper door and watch the catfish swim back upstream after the dam releases its flow every afternoon. It is a daily migration of sorts. osprey, eagles, great blue herons, snowy and great egrets and all styles of men are clued in and gather along and above the river and dam to fish for food. Stripped bass, carp, drum, crappie are just some of the over 70 species of fish that are caught here. 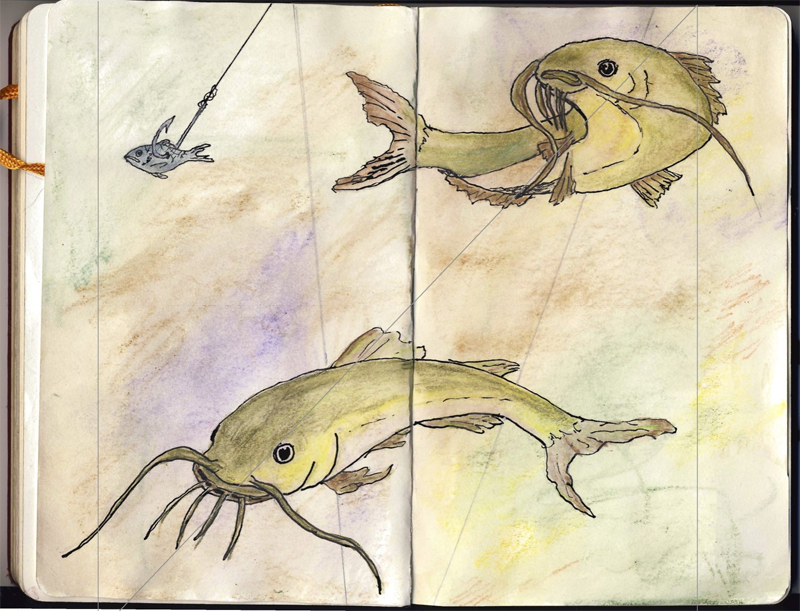 But the real fisherman's delight, the KING fish so to speak, is the catfish. There are a couple of different kinds...and I can now tell a flathead catfish from a channel catfish... I think. They are fierce to look it. And my response to all Siluriformes I have seen so far is, "Eeeuw"! Catfish is popular eating in this area...popular like a Big Mac is popular. The men who fish at the dam rave about how delicious catfish are. "Fry 'em up with some hush puppies - ain't nothing better." Compiling the suggestions of Ted, Jerome, Will, Juan and many others we set forth to eat catfish at their top three suggested fried catfish dinning establishments. Next on the list was Huck's, a more upscale establishment out on the main highway to Dallas. This time the onions came sliced with little plastic lidded condiment cups containing relish and tartar sauce. There were also sides of slaw and potato salad and under the heap o' fried catfish lurked the usual little pile of hush puppies. Way too much to eat and no beer. On the rating scale, Bernie preferred Hucks to Windy's. I like the place with the beer. And today, we took our final journey to what some perceived as the best catfish place in the area. On Fridays and Saturdays only, Speed's Live Bait, Tackle, Pizza and Notary Shop serves a fried catfish buffet for lunch. The place was busy with friends and family chomping down on the fried fish, mashed potatoes, corn, green beans, and corn bread. Everything was homemade and all the vegetables were well steamed. Bernie took steamed fries and mashed them into his whipped potatoes and poured gravy on top. (I am so proud.) Best of all there were some juicy tender bar-B-Q ribs under the warming lights. Well, maybe best of all was the homemade banana, nilly-wafer pudding. Stir it all together and store in a plastic bucket. Do not refrigerate and for god's sake keep it covered. Great hearing from you. Go Further. You are in what we call "flyover" country, which most people never visit. Well, judging by your chronicles, they sure are missing a lot! I like those Cats too and Rod has a pond full in FL. His wife, Susan tosses some dog food in the shallow area and grabs them when they come for it. I wouldn't believe that either if I had not watched. Sounds like you are still having fun. Is that Bernie with a beard holding the fish? Stan, Bernie has been close to that hairy, but never so thin. Loved the story! Maybe not the bait recipe - ugh! All these years I thought it was Wendy's. Hmmph. Glad you got it right. The drawings are great.